Valaciclovir is an antiviral medicine containing 500mg of the active ingredient with the same name. It is used to control genital herpes outbreaks caused by the herpes simplex virus. What is Valaciclovir and what does it do? Genital herpes is a sexually transmitted infection (STI) that can affect both men and women. Symptoms of genital herpes include red, painful blisters around the genital area. Valaciclovir tablets treat genital herpes by hindering the growth of the virus causing the outbreaks. Valaciclovir may be prescribed to treat genital herpes outbreaks in men and women. Although the condition cannot be cured, genital herpes treatments such as Valaciclovir offers relief by helping you control and limit the outbreaks. 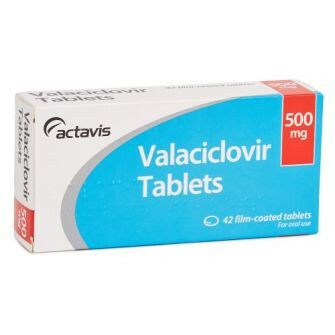 You are likely to be prescribed Valaciclovir to treat recurrent outbreaks of genital herpes. If you are experiencing a genital herpes outbreak for the first time, you should consult your GP or a sexual health clinic before ordering your treatment. Is Valaciclovir suitable for my condition? Yes, Valaciclovir tablets may be suitable if you have previously been diagnosed with genital herpes and use this treatment to control the outbreaks. There are however some conditions and medicines that can affect the suitability of this medicine. It is important that you let our doctors know if any of the below applies to you. You can inform our doctors by including any relevant information when you fill in the medical questionnaire. You are allergic or sensitive to Valaciclovir, Aciclovir or any other ingredient listed in the patient information leaflet. Note, you should consult your GP or pharmacist before you take Valaciclovir is you have any liver or kidney problems, are over the age of 65, have a weak immune system or are taking any medicines affecting your kidneys. What is the recommended dosage of Valaciclovir? You should follow the doctor’s instructions on how to take this medicine. The doses outlined below is for your reference only. The dose may vary depending on the condition being treated. Take 1 tablet, twice daily for 5 days. Swallow the tablets whole with a glass of water. Take the tablets at the same time every day throughout the course. Please note, you are advised to drink plenty of water when you take Valaciclovir tablets. Does Valaciclovir cause any side effects? You will find more information about side effects in the patient information leaflet. Please read this thoroughly before taking this medicine. Contact your GP or nearest surgery immediately if you notice any signs of an allergic reaction, including swelling of the lips, face, neck and throat or difficulty breathing. Yes, you can reduce the risk of experiencing side effects by drinking plenty of water while taking Valaciclovir. This will reduce the risk of side effects affecting your kidney and nervous system. You can also reduce the risk of side effects by letting our doctors know of any other condition you may have, and any other medicines you may take. Please include this information in the medical questionnaire. How do I buy Valaciclovir online? To order Valaciclovir online, you need a valid prescription. A prescription can be obtained from your GP, or from our online doctor service by filling in a medical questionnaire. Doctor-4-U is a legitimate and fully regulated service that allows you to request a private prescription for selected conditions. A digital copy of your prescription will be sent to our pharmacy who will dispense and dispatch your medicines, usually within 24 hours of your order being placed. Take ONE tablet TWICE daily for 5 days.